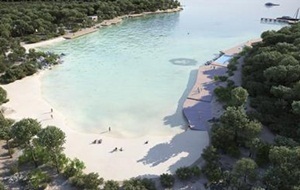 The 1.5 kilometre beach Rajska plaza is situated in Lopar, 14 kilometres from the town of Rab. Due to its high quality and the crystal clear sea, it has been awarded the Blue Flag label. It is a perfect destination for non-swimmers and families with children because of the very shallow sea and the experienced life-guards, who are on the watch from 9 am to 6 pm. 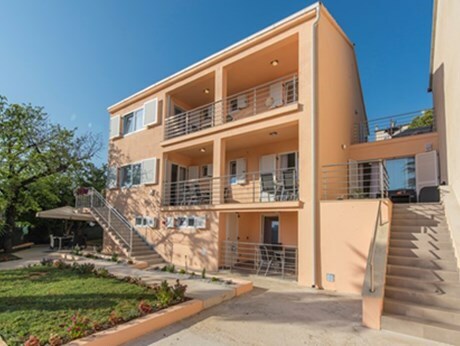 The facilities available on this beautiful sandy beach are outdoor showers, bars, restaurants, various sports fields, bike trails and many water sports possibilities. 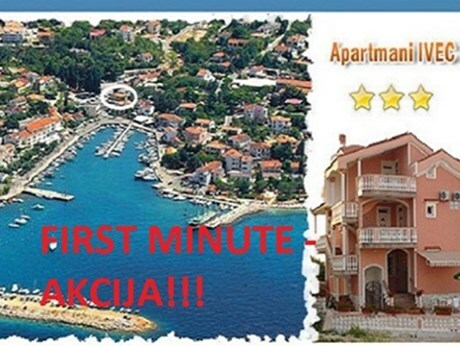 Situated in the very Crikvenica, it is one of the most famous sandy beaches of the Crikvenica Riviera. The beach Crni molo offers various possibilities for sports activities, such as aerobics, sand volleyball, mini-golf, a water slide, or water skiing... Also, for those who do not want to spend their time in the shade, it is possible to rent beach umbrellas and deck-chairs. After the swim in the sea one can use one of the outdoor showers to freshen up. There are restaurants, cafes and hotels that surround the beach, which makes it a favourite destination for both young people and families with children. 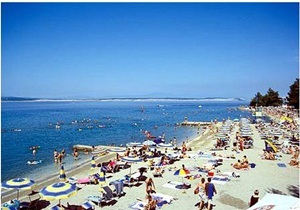 The most known beach in Medulin which extends one kilometre along the coast is the sandy beach Bijeca. It is surrounded by numerous trees, the shade of which is mostly enjoyed by the senior people. 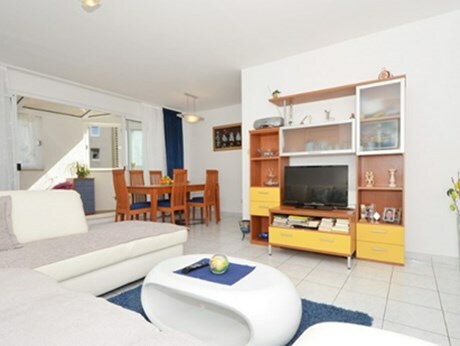 Due to the flat sea entrance, families with children visit it gladly. It has a water slide, one of the favourite entertainment facilities for children and the youth who like to play 'picigin' there. It is surrounded by beautiful small islands, the view of which you can enjoy from one of the bars or restaurants there. 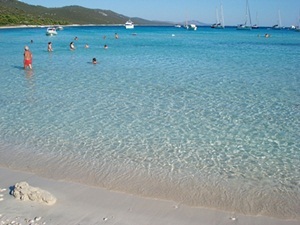 In the proximity of Veli Rat, in the northern part of Dugi otok there is the beach Saharun. 800 m long, surrounded by the pine tree wood on the one side and the crystal clear sea on the other, it is the ideal destination for romantic couples, senior people and families with children at day. In the evening Saharun transforms and becomes the favourite destination of the youth who organize beach parties in numerous bars and cafes that may last long in the night. 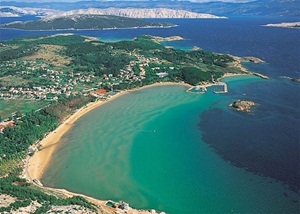 The beautiful sandy beach Sabusa is situated within 15-minute walking distance from Kukljica on the island of Ugljan. Although it is classified as a sandy beach, its coast is concrete which makes it ideal for sunbathing. 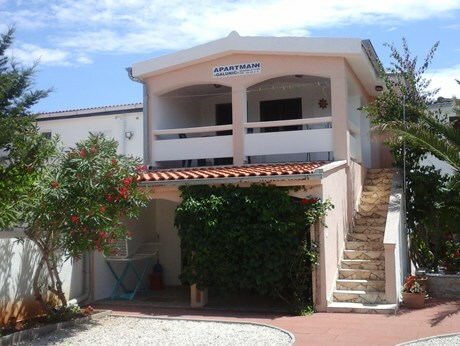 Due to the shady beach parts and the shallow crystal clear sea, it is the perfect choice for families with children. If you get hungry after the water volleyball, there are bistros with food and drinks. In ten minutes walk, the braver ones will be able to reach the naturist beach Mala Sabusa where clothes are optional. in Sabunike. You will be able to enjoy the crystal clear sea and the relaxing medical mud therapy. 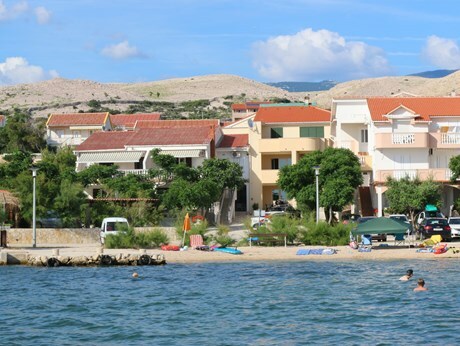 Because of its position in the stunning bay where the breeze from the Velebit blows, it is a perfect place for sailing and surfing. There are many shops, restaurants and ice-cream parlours on the beaches. Nature lovers will enjoy a visit to National parks. 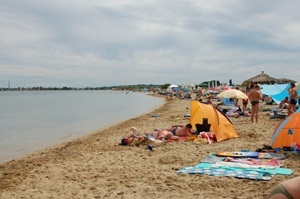 A kilometre from the centre of Murter there is the sandy beach Slanica. As it is one of the best beaches in Croatia, there is a great number of visitors there at any time. The shallow crystal clear sea makes it a favourite gathering place of the ‘picigin' players. On the concrete part of the beach Slanica there are many cafes and bars, and an entertainment child centre, which is why a lot of young people and families with children visit it gladly. Nearby there is a camp with rentable boats, scooters and bicycles, and in the close proximity there is a nudist beach as well. One of the most beautiful sandy beaches of Croatia - Vela Przina – lies 6 kilometres from the town of Korcula. 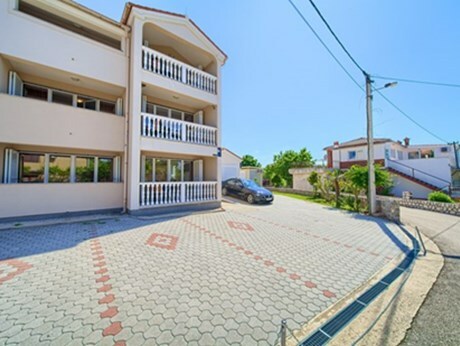 Situated in a bay and surrounded by vineyards, it is very popular among young people who come to have fun playing volleyball and 'picigin' or hang out in one of the bars or restaurants. It is possible to rent deck-chairs and beach umbrellas to hide from the sun on this sandy beach. Or you can bring your family to the beach to have fun in the sand and the shallow crystal clear sea.